I love to challenge myself to learn new digitising skills and my customers to develop new machine embroidery skills. The latest project for this Christmas has been my biggest challenge yet. My first crazy quilted stocking has proved very popular but I am very much aware that it is not a stocking that will hold very much, so I decided to digitise a larger one for you all. However as you increase the size of the finished product, you limit the hoops that can be used and the amount of re-hooping that is required. Although my customers will be familiar with my Outline alignment stitches (OAS), I decided that more help was required for this stocking to avoid misplacement so I started to look at ways to make this foolproof. My inspiration came from a very unusual source, globe making ….. I originally started at the toe of the stocking, working upwards but it was only when I was watching an old Pathe News film on creating globes that I realised how important it is that the stocking placement should not necessary start on the edge but in the middle, working in both directions, so there is less room for misalignment. Video of globe making This also gave me an idea of giving each design an extra set of green alignment stitches with markers in the middle and at the edges, and attaching stitches which can easily be removed if placement is not accurate. It is very important to match the green markers in the middle first, and then the outer ones should be accurate. If you start at one end alignment may be more difficult. Although my OAS are shown in red, blue and green so they are evident I do not suggest that they are actually stitched in these colours! The stocking has also be divided into 4 designs for those with 300mm x 200mm hoops. To get the best results for this large stocking it is also important to print out the prepared templates which are included in the zip files. I was recently asked how to print out templates and what benefits templates of designs can give in design alignment. When you open embroidery designs in your embroidery software you should be able to print out the design at its actual size. 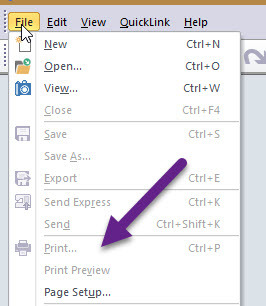 The print and print preview options are usually under the “file” drop down menu along the top of the page when you have a design open in your software. Select print preview to see how many pages the design has been divided into. When the pages are printed you can trim around the designs and join them with sticky tap if necessary. However if you do not have the software, you will have to “print” it out on your embroidery machine. If you are dealing with Graceful Embroidery designs, many have the option of Outline Alignment stitches (OAS), and the first colour way will give the outline of the design. Providing your designs have OAS just hoop the stabiliser and stitch out the outline without any thread so you have the outline punched out by the empty needle. For any designs which do not have Outline Alignment stitches, you could do the same thing and without the thread move the design to important and relevant sections to punch out the shape. Remove from the hoop and use these “join the dots” of the design to fill in with pencil if needed and cut around the design. Another option for templates is just to stitch out the design on fabric scrapes. This is not too time consuming for simple designs but probably impractical for designs with high stitch counts. Templates are great and I used them frequently when deciding with a bride where to place the embroidery on her dress. If you are planning an embroidered project for somebody else they many need this visual aid. 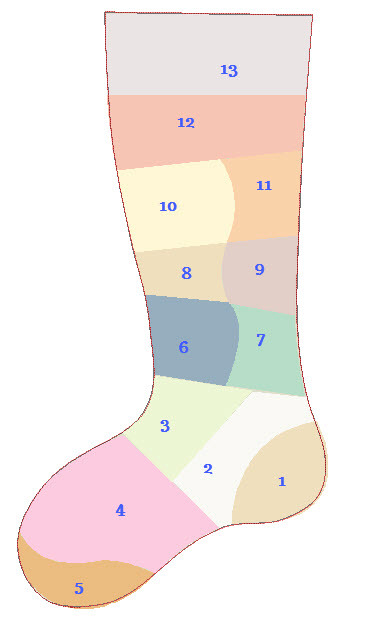 I have decided that a template is another way to get guidelines for this large stocking, which is vital as you start with the heel of the stocking and want to be certain that it is correctly placed so the whole stocking fits on your base fabric. The templates will be included in the zip file of designs with the PDF tutorial. 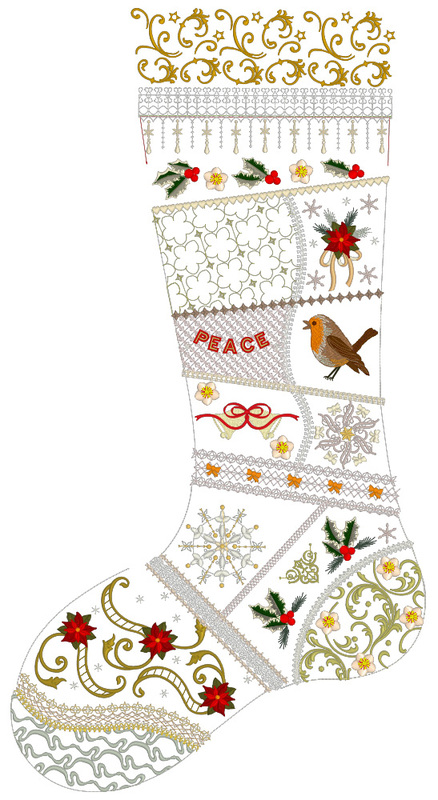 Print them out, trim and join them with sticky tape, so you can transfer the markings to the base fabric of the stocking. 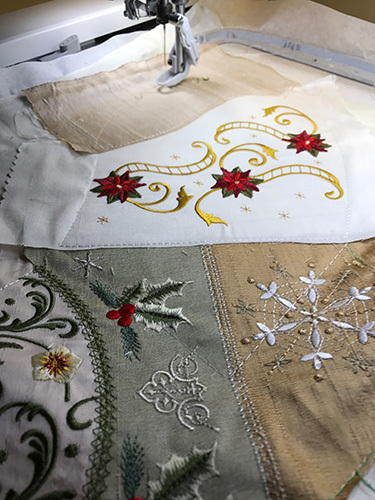 The stocking which measures 650mm x 340mm (25.6″ x 13.35″) consists of 13 fabric pieces which are embroidered on top of this fabric, so any markings you make will not be seen when it is finished. You will need to re-hoop stabiliser and align your base fabric for each of the 10 designs if you only have a 240mm x 150mm hoop. 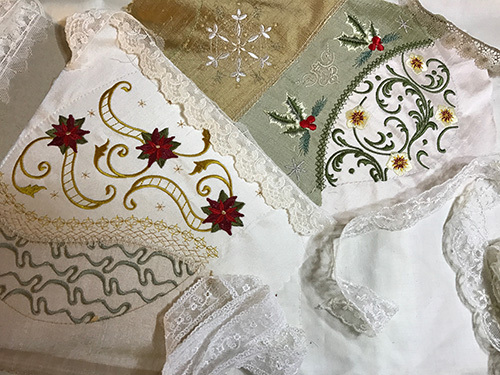 I have also opted for a 3/4″ lace strip to be embroidered on tulle or organza beforehand, so it can be secured across the foot of the stocking, covering the joins of several designs. Obviously any lace in your stash can be substituted for this and for any other joins in the stocking which you think will be improved by lace. 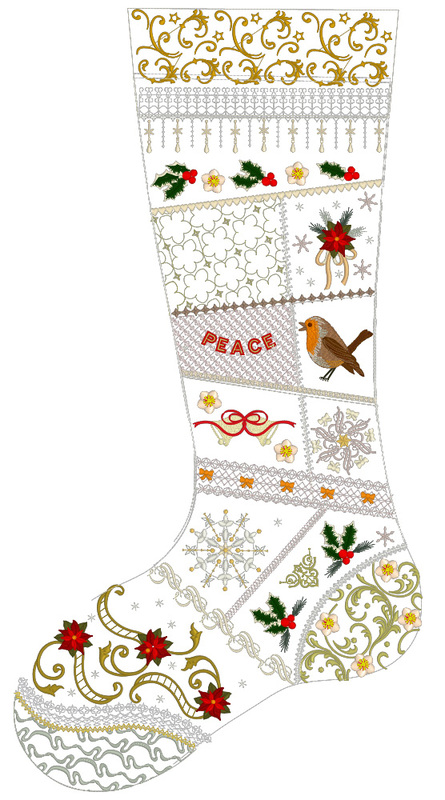 This large stocking has lots of room for embellishment, and some areas are more heavily embroidered than others. 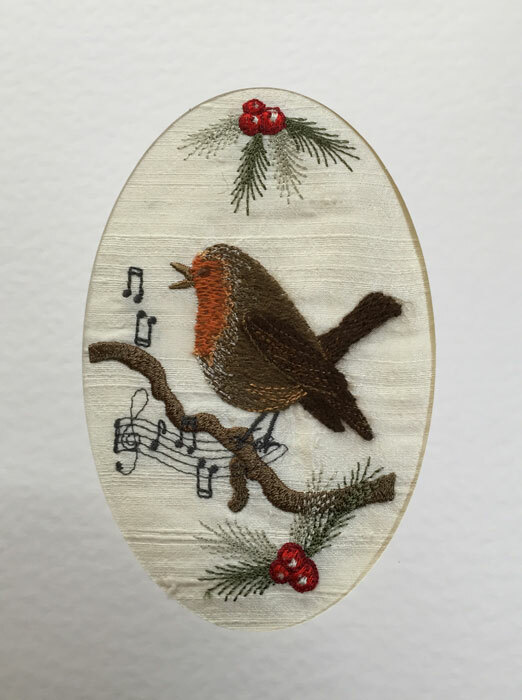 The robin in the stocking is also available on its own to stitch on Christmas cards in Sulky rayon or Madeira Lana, and there is a special design that I used last Christmas for my sisters embroidered card. I successfully embroidered out the robin in Madeira Lana which is a wool thread. It needs special needles produced for Lana thread, and I lightly brushed the robin with the metal brushes which Madeira have created. You need to slow your machine down to use this thread and you should clean out your bobbin area afterwards as there tends to be more lint and fluff. 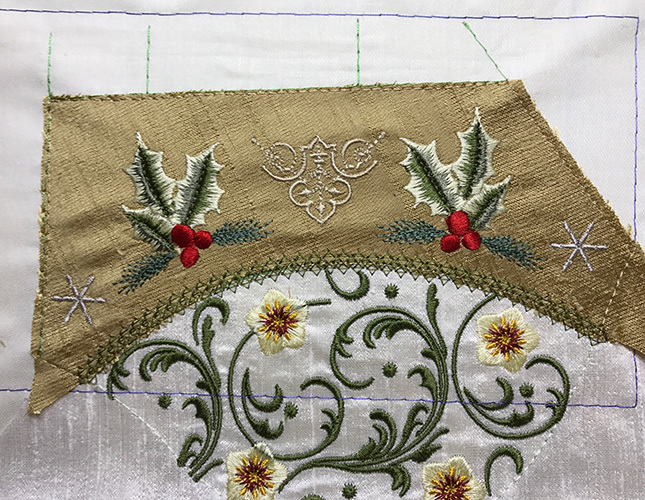 This entry was posted in Discussing machine embroidery, Embroidery projects, New Designs and tagged aligning designs, Christmas, Crazy quilting, Hooping only stabiliser, machine embroidery, templates. Bookmark the permalink. I am interested in receiving your Celtic angel design. Please let me know how to get it!! Love your designs!! !